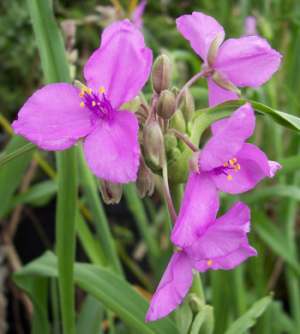 This is truly the finest Texas native Tradescantia for our landscapes. The colony in my garden is derived from plants collected many years ago from a vacant lot near Lake Dunlap, just outside of New Braunfels. The blooms are borne on multiple, 3-foot-tall stems for at least six weeks in early spring. Flower color ranges from deep blue to purple to a reddish violet. For best results, give these plants morning sun and shade after 2:00 PM. Maintain a 4-inch-deep, shredded hardwood mulch around their base and water deeply on the day before they would have wilted. Though they can survive with no watering, they are more attractive with supplemental irrigation.